Trump's Final Push Includes Heavy Message for "Radical Resistance"
In the final hours before election day, President Donald Trump was unafraid to discuss the elephant in the room. I’m speaking, of course, about the radical leftist mobs that have infiltrated our society at the behest of prominent democrats such as Eric Holder and Maxine Waters. These two leftist agitators are merely the tip of the iceberg, but their pointed and provocative statements on the treatment of American conservatives will long live in infamy. The President has taken umbrage with this tone on several occasions, hurling a number of combative phrases in the general direction of the mainstream media for their incitement of such mobs. Last night’s Make America Great Again Rally included a number of heartfelt pleas for peace. 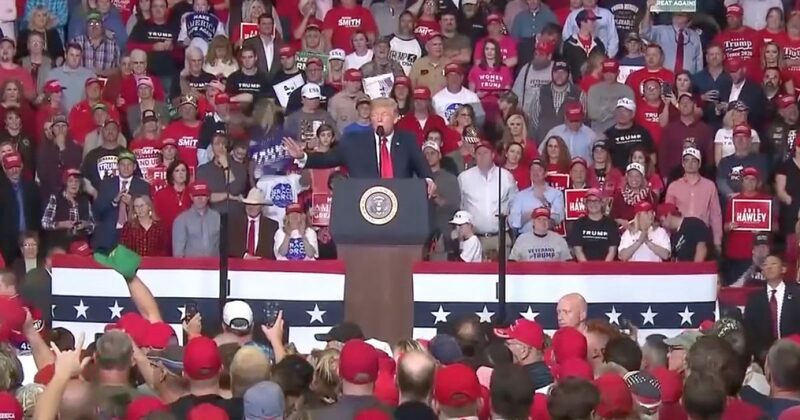 President Trump brought out the big guns in his final rally before Election Day as he made his closing argument, urging voters to “stop the radical resistance in its tracks” to prevent Democrats from undoing the gains he’s made in his first two years. In a rally in Cape Girardeau, Missouri, talk radio host Rush Limbaugh emerged first, drawing cheers from thousands packed into an arena. The President has also expressed regret over the bombastic tone that he has taken as of late, but has said that he has had “no choice” in the matter due to the unruly rhetoric he faces on a daily basis.